TheCarConnection.com strongly recommends the dynamic multi-contour seats, which help keep backs and shoulders in check on long road trips. The 2009 Mercedes-Benz S-Class is one of the best vehicles in the world—but you’ll pay for it. To bring you this inclusive review of the 2009 Mercedes-Benz S-Class, experts at TheCarConnection.com searched the Web for the best observations from vehicle critics and reviewers. 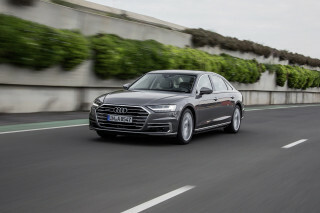 Combined with driving opinions from our own editors, TheCarConnection.com hopes that this review will be of more use to shoppers than any individual road test. The Mercedes-Benz S-Class has a long-held reputation for being a sort of standard-bearer for high-class luxury sedans; the S-Class doesn’t so much compete with prestige luxury cars such as those from Bentley and Rolls-Royce, but it holds the high-water mark for high-tech safety features and electronics-laden conveniences. Mercedes-Benz last gave the S-Class a major redesign in 2007; at that time, the big luxury sedan became a little more curvaceous and fun to drive, and of course stepped up the number of leading-edge features. Powertrains on the U.S.-spec S-Class include a 382-horsepower, 5.5-liter V-8 in the S550, a 510-hp, twin-turbo V-12 in the S600, and a 604-hp version of the V-12 in the S65 AMG models, as well as a V-8 AMG model, the 518-hp S63 AMG. The S550 can get to 60 mph in less than 5.5 seconds, but the S600 can make it in a mere 4.5 seconds. The S550 is also offered in a 4Matic all-wheel-drive model, which TheCarConnection.com recommends for those who drive frequently in winter conditions. The 2009 Mercedes-Benz S-Class V-12 models come with a five-speed automatic transmission, while V-8 models get a seven-speed automatic; both have Touch Shift manual control. The standard S550's powertrain provides plenty of muscle to move the 2009 Mercedes-Benz S-Class with authority, but the S600's V-12 kicks in an extra measure of omnipresent torque and is especially quiet and refined. However, you can feel the added weight of the engine in the S600, and it doesn't handle with quite as much agility. The 2009 Mercedes-Benz S63 and S65 AMG up the ante with spiffy add-ons like Active Body Control suspension, a SpeedShift transmission system, high-performance tires, a sport exhaust, aerodynamic lower bodywork, Drive-Dynamic ventilated multicontour seats with exclusive leather upholstery, and special gauges. Thanks to a host of electronics, the S-Class handles quite well. The standard Airmatic suspension has adaptive damping to adjust quickly to rough roads or fast driving on switchbacks. All 2009 Mercedes-Benz S-Class models have a very absorbent, well-settled ride that manages to soak up small potholes with little jarring inside the cabin and remain remarkably quiet. The latest version of Mercedes-Benz's COMAND screen-based interface replaces the clutter of smaller controls in the 2009 Mercedes-Benz S-Class, but it's not always as intuitive as it could be. The S-Class's interior is very spacious and well designed. The shift control is located along the steering column, which frees up the center console area compared to other vehicles, and the instrument panel has a simple but very elegant design, with a broad, sweeping horizontal theme and impressive-looking wood veneers. Standout features of the S-Class include "smart" cruise control, called Distronic Plus, which can slow the car as traffic dictates, making it possible for the driver to "set and forget" the cruise control over a wider variety of operating conditions. For 2009, the Mercedes-Benz S-Class gets new steering-wheel shift paddles, redesigned power window switches, and a "Hold" braking feature. There’s also a new Night View system, which allows the gauge area to turn into an infrared camera view of the road ahead, and concert-hall-quality 14-speaker Harman Kardon surround sound stereo. The 2009 Mercedes-Benz S-Class offers a panorama-style roof, Active Body Control (ABC) suspension, and heated/ventilated front seats with built-in massager. Even the base S550 has a wood and leather steering wheel, active ventilated and heated front seats, new wheels, and a power trunk lid. Anti-lock brakes and stability control are standard on the S550, along with a hill-start assist system to keep you from rolling backward when facing uphill. The 2009 Mercedes-Benz S-Class has not been crash-tested in the United States, but it enjoys a long-standing reputation as one of the safest vehicles in the world; safety features include front and rear side airbags, full-length side curtain airbags, active head restraints, adaptive brake lights, and the Pre-Safe system, which prepares safety equipment for an anticipated collision. The 2009 Mercedes-Benz S-Class is almost perfectly styled inside and out. 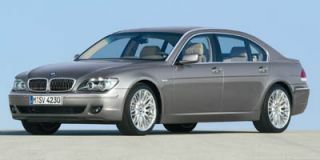 The 2009 Mercedes-Benz S-Class costs a pretty penny, so experts at TheCarConnection.com expect it to be immaculately designed. Fortunately, the S-Class delivers. Motor Trend feels the latest S-Class "continues to set the standard" for full-size luxury sedans, while Car and Driver likes its "handsome exterior design," and ForbesAutos calls it "elegant." As Kelley Blue Book says, the Mercedes-Benz 2009 provides a "polished, sleek shape," with its sloping front end and its classic Mercedes grille. Cars.com also singles out this last aspect of the 2009 Mercedes-Benz for its style, stating that its "strong visual presence is highlighted by a sleek front end." The front end of the Mercedes-Benz 2009 isn't its only exterior appeal; Edmunds praises the "aggressive wheelwell flares and a wedge-like profile that's emphasized with a rising character line," and Cars.com reports the optional AMG Sport Package "gives the S-Class some of the look, if not the performance, of a high-performance AMG version of the S-Class." Cars.com contends the interior of the S-Class "offers a level of power, luxury, technology and prestige" worthy of its hefty price tag. The S-Class's interior is very spacious and well designed; it's "ostentatious and comfortable," according to ForbesAutos. Kelley Blue Book agrees, saying "understated elegance is the theme on the inside" of the Mercedes-Benz 2009, while noting the "amber ambient lighting" that rings the front of the cabin. 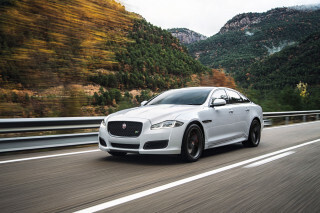 The outside is a prelude to a car that "defines luxury motoring," ConsumerGuide declares. The instrument panel has a simple but very elegant design, with a broad, sweeping horizontal theme and impressive-looking wood veneers. TheCarConnection.com’s editors note that the latest version of Mercedes-Benz's COMAND screen-based interface replaces the clutter of smaller controls in the 2009 Mercedes-Benz S-Class, but it's not always as intuitive as it could be, as will be discussed more in the Features section of this review. The 2009 Mercedes-Benz isn't just for appearances—it's also a strong performer. 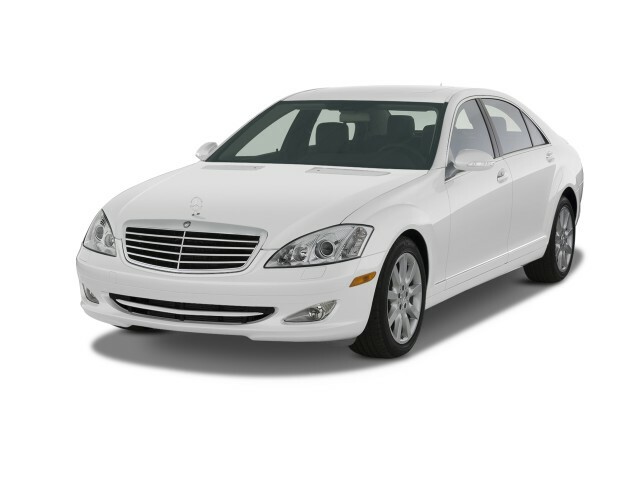 Experts at TheCarConnection.com find that the 2009 Mercedes-Benz S-Class performs well—which is good, considering the price tag on this baby. Cars.com says that any one of the options in the S-Class's engine lineup is "powerful and makes this big sedan lunge forward when you mash the gas pedal to the floor." The 2009 Mercedes-Benz S-Class provides a total of four different engine options. The S550 comes with a 5.5-liter V-8 with 382 horsepower and 391 pound-feet of torque; the S600 has a 5.5-liter twin-turbo V-12, with 510 hp and 612 lb-ft of torque; the S63 has a 6.3-liter V-8 with 518 hp and 465 lb-ft of torque; and the S65 AMG gets a powerful 6.0-liter V-12 turbo, which creates a whopping 604 hp and 738 lb-ft of torque. Even the smallest of the available engines in the 2009 Mercedes-Benz creates a driving machine that maintains "stunning performance," says Edmunds: "Zero-to-60-mph times range from the low-four-second to low-six-second range—seriously quick by any standard, let alone when one is referring to a large luxury sedan." Cars.com calls driving that version of the Mercedes-Benz 2009 a "performance treat," and Kelley Blue Book highlights its "effortless power." The smallest engine on the S550 achieves 0-60 in just under six seconds: "Mercedes-Benz cites a zero-to-60-mph time of 5.4 seconds for the S550, which is stunning considering the sedan's 4,465-pound curb weight," Cars.com reports. On the other end of the range, the 6.0-liter V-12 turbocharged engine powers into the four-second range, which explains why ForbesAutos notes that in the S-Class, acceleration is "brisk but smooth." All of the trims use automatic transmissions. ConsumerGuide is impressed with the automatics' performance: "downshifts are quick," and "passing power is particularly impressive." 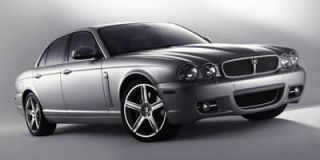 The V-12 engines are paired with five-speed transmissions, while the V-8 models use seven-speed transmissions. Cars.com points out that the seven-speed transmission in the S-Class "performs in a purposeful, quiet way." Mercedes offers an all-wheel-drive option on the S550. Most of the powerplants get EPA-estimated 11 mpg city and 17 mpg highway; the 5.5-liter V-8 achieves a slightly better 14/21 mpg on the rear-wheel-drive version and 14/20 mpg on the all-wheel drive. As Kelley Blue Book puts it, "fuel economy is slightly less than its contemporaries, but that's probably not a major purchase issue." Edmunds states that overall, "handling and ride dynamics are impressive." All of the 2009 Mercedes-Benz S-Class models have a very absorbent, well-settled ride that manages to soak up small potholes with little jarring inside the cabin and remain remarkably quiet. ConsumerGuide likes the combination of comfort and control, saying "the suspension offers Sport and Comfort firmness settings; Sport makes the ride slightly more taut but at little sacrifice in comfort"; they also appreciate how the S-Class models' "suspension automatically adjusts for firmness and load leveling." Yet thanks to a host of electronics, the S-Class also handles quite well—and gets tauter and more responsive in AMG editions. The standard Airmatic suspension has adaptive damping to adjust quickly to rough roads or fast driving on switchbacks. Cars.com contends that even though the 2009 Mercedes-Benz measures in at 17 feet, it's "pretty easy to maneuver through heavy, fast-moving highway traffic and feels rock-solid doing so." ForbesAutos notes its "secure handling," while Car and Driver adds, "All models are nimble for big cars, but the S63 AMG adds a new level of athleticism to the line." The 2009 Mercedes-Benz S-Class is designed to be a luxury car—and it lives up to its calling. Editors at TheCarConnection.com drive a lot of vehicles—and the 2009 Mercedes-Benz S-Class is one of the best when it comes to comfort and quality. ConsumerGuide says that, overall, the 2009 Mercedes-Benz S-Class "affords outstanding room and comfort." The front seats are spacious in a "large, soft, leather easy-chair type of way," according to Cars.com, and an optional set of "Drive-Dynamic" seats have amenities such as "fan ventilation, automatic-inflating side bolsters, and a relaxing massage function." In back, the S-Class caters to two. ConsumerGuide remarks that, even with intrusion from the sunroof casing, "only the very tall will find headroom lacking." Edmunds likes the room in the backseat of the 2009 Mercedes-Benz and believes this is what makes it a "favorite of wealthy dads and heads of state alike." Cars.com actually goes so far as to call it a "massive backseat" that "offers tons of legroom and a backrest that's angled backward for optimal comfort" and sports "power-adjustable rear seats," though they note the rear bench is designed for two people, not three. Car and Driver reports, "All models are big, posh, and capable." Kelley Blue Book points out that, inside, "storage spots are numerous" and calls the trunk a "trip-friendly luggage swallower." Even though you wouldn't guess it from the look of the rear end of the S-Class, the trunk is large, and ConsumerGuide says it is "usefully shaped, nicely finished, and includes an underfloor storage bin." The interior of the Mercedes-Benz S-Class is designed with the driver and passengers in mind, with ease of use for controls and top-quality materials. Cars.com notes that luxury still applies to the design of the interior controls, pointing out the "leather instrument panel cover and classy chrome power window buttons," as well as the "beautiful burl walnut wood" that "graces the dash, doors and center console." For 2009, a wood and leather steering wheel is included on the S550. The aural quality of the S-Class is just as one would expect, and ConsumerGuide says, "travel is serene, with little road or wind noise." A host of high-tech safety features on the 2009 Mercedes-Benz S-Class add to its already secure feel. 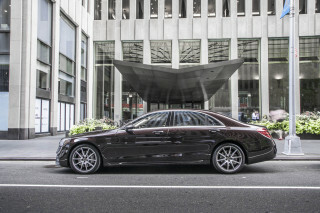 Experts at TheCarConnection.com love the safety features included on the 2009 Mercedes-Benz S-Class, even though the vehicle has not yet been crash-tested. Neither the National Highway Traffic Safety Administration (NHTSA) nor the Insurance Institute for Highway Safety (IIHS) have yet crash-tested the S-Class. Still, the 2009 Mercedes-Benz S-Class has many standard safety features, including side curtain airbags, front and rear side airbags, an anti-lock braking system, and traction control, reports ConsumerGuide. An optional safety feature on the 2009 Mercedes-Benz is Night View Assist, which can see "almost 500 feet ahead of the car and display the view in the instrument panel," according to Cars.com. Even more fun are the high-tech goodies. The Pre-Safe system is Mercedes' way of mitigating an impending accident. As Cars.com explains it, "by monitoring the braking, steering and stability systems, Pre-Safe can ready occupants for a collision by tightening the seat belts, adjusting the position of the front passenger seat and available power rear seats, and closing the windows." An even more advanced version of Pre-Safe requires the optional Distronic Plus adaptive cruise control, which brakes and accelerates the Mercedes-Benz 2009 as needed to avoid accidents. The 2009 Mercedes-Benz S-Class is a luxury vehicle, with a features list that might leave only sultans wanting. The S-Class's "long list of comfort and convenience features assures bragging rights among even the most jaded enthusiast," ForbesAutos says. All S-Class sedans come with features such as "a navigation system, hands-free cell phone communication, a Harman Kardon audio system and of course, rich leather and wood trim," Edmunds reports. That "fine-sounding 14-speaker, 600-watt harmon/kardon(r) surround-sound system," Kelley Blue Book states, "plays CDs, DVDs and MP3s." Also standard in the S-Class is the Mercedes COMAND system, which uses a knob controller and an in-dash screen to control secondary functions, much like similar systems from BMW's iDrive and Audi's MMI. ForbesAutos reports that "some may still complain that it's not as user-friendly as it could be." Car and Driver asks rhetorically, "How many electronic gizmos are too many?" Kelley Blue Book contends that it takes a only a modest amount of study time to learn to operate the "COMAND system, through a turn-and-push, aluminum knob on the center console," which then allows the driver to utilize the one control for navigation, radio, phone, and other settings. Most other reviews grouse about using COMAND and the confusion that ensues; Cars.com says COMAND is "one of the more user-friendly versions" of these systems, but all the "high-tech features can be confusing." Higher-end trims bump up the equipment ante. As Edmunds points out, the "AMG versions add 20-inch alloy wheels, an active suspension, larger brakes, sport seats and specific interior and exterior styling tweaks." 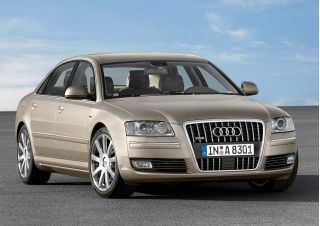 New for 2009 are new steering-wheel shift paddles, redesigned power window switches, and a "Hold" braking feature. The S550 now also gets a power trunk lid, new wheels, and active ventilated and heated front seats.